Facebook is quietly introducing a big update to dynamic ads today that should be a positive enhancement for smaller e-commerce brands — if not all e-commerce brands. Beginning today, some advertisers will be able to show dynamic ads to users who have browsed multiple websites or engaged with content on Facebook looking for a similar product. Dynamic ads were first launched a couple of years ago (then called Dynamic Product Ads). These ads allow advertisers to dynamically show ads from their product catalogs to potential customers based on interaction with their websites or apps. 1. Remarketing: Remarketing is the ability to create an audience of people who have visited your website and then show that audience a related ad. While you can remarket without dynamic ads, advertisers haven’t been able to run dynamic ads without remarketing. 2. Product Catalog: The benefit of dynamic ads is that it’s dynamic. So while you could manually create audiences and ads targeting people who have viewed a product on your website, for example, dynamic ads do it — of course — dynamically. One reason this is possible is thanks to product catalogs. 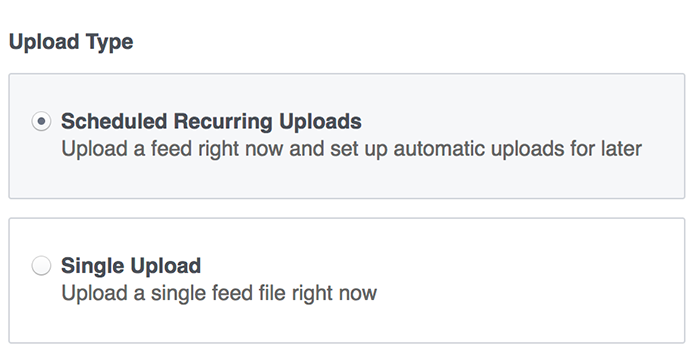 Advertisers upload either a static product catalog file or provide Facebook with login credentials to access a fresh product catalog regularly. 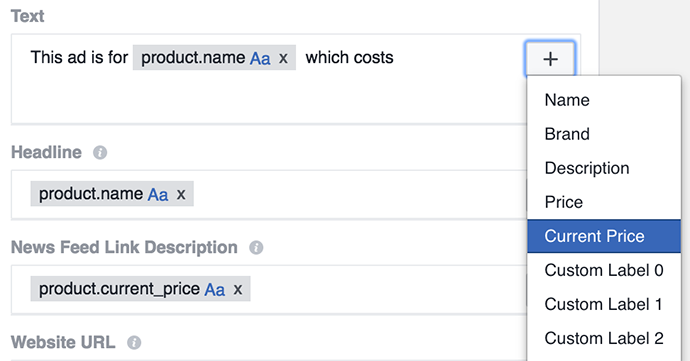 This way, Facebook knows what products you sell and the details that they can display within an ad (title, description, image, availability, price, etc.). 3. Ad Template: How do you create a single ad that can magically show different products depending upon the user? With an ad template, of course. Ad templates allow advertisers to reference variables within ad creation instead of committing to a specific product. Dynamic ads are great for saving time. However, they’ve really only been useful for big e-commerce companies that drive considerable website traffic. The smaller e-commerce sites have been limited by their traffic. They can only spend money on dynamic ads to reach people who have visited their websites. Without that traffic, there are fewer people to reach and fewer ads to be shown. This has been a negative for advertisers but also for Facebook. It limited potential ad revenue. Beginning today, Facebook will roll out an update to dynamic ads that allows advertisers to reach “Broad Audiences” — or more than those who engaged with their website or app. Targeting for dynamic ads will now include reaching those who engaged with content on Facebook or browsed multiple websites looking for a similar product. The key here is “browsing for furniture across multiple websites.” Not your websites, necessarily. Any websites. A user could be checking multiple websites for a product, or they maybe clicking content on Facebook that provides Facebook with signals that indicate they may be interested in buying a certain product. The end goal here is to chip away at purchase intent. 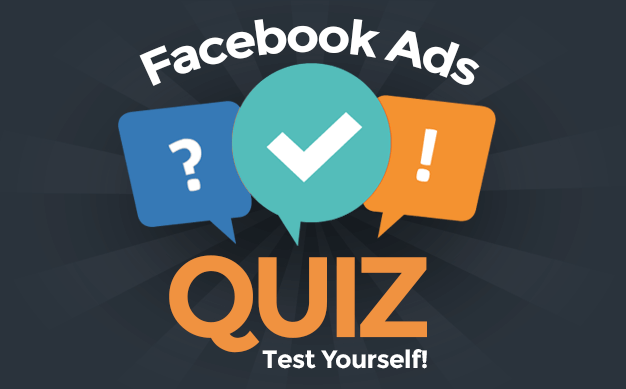 Outside of remarketing, it has been challenging to target people on Facebook interested in buying your product. First, let’s point out that it’s not entirely clear how this will be executed. But that won’t stop potentially unhappy people from finding something wrong with this. Someone visited my website and looked at my products. But Facebook is going to show ads featuring the products of a competitor??!! Yeah, they might. But this isn’t much different than showing ads using interest targeting based on engagement with your Facebook page. Facebook has informed me that advertisers will not be able to specifically target, for example, users browsing your website. Instead, it’s a matter of taking in all signals — website browsing and Facebook activity — when forming a Broad Audience. 1. Users: This can improve relevance of ads, which helps the overall experience on Facebook. 2. Small E-commerce Brands: This gives them new opportunities to show relevant ads to potential customers. 3. Facebook: This allows those small e-commerce brands to spend more money. And if it’s effective, this could help large e-commerce brands as well. This enhancement makes dynamic ads a lightweight and effective solution for acquiring new customers. We can automatically reach a huge audience with personalized recommendations from our catalog of more than seven million products. With dynamic ads, we are beating our customer acquisition efficiency target by more than 20% at a scale that is meaningful to our business. From this quote, it’s not clear how the enhancement has impacted Wayfair’s dynamic ad results. Once again, we won’t know until we start trying it out ourselves. If you are in North America and do not yet have this update, it’s not clear when you can expect to see it. As always, it helps to have an ad rep.
What do you think of this update? Do you think it’s an improvement?